Dental implants are man-made replacements for the tooth root. They provide a foundation for replacement teeth that look, feel and function like natural teeth. The implants themselves are titanium posts which are placed into the jawbone where teeth are missing. The bone bonds with titanium creating a foundation for artificial teeth. Implants stimulate the bone to prevent or avoid bone loss. When a tooth is lost, the bone that was holding the tooth in may be lost as well. Without stimulation from teeth or implants, bone is lost over the rest of the patient’s life. This can also accelerate changes in facial muscles and appearance that occurs with age. Implant prostheses can restore some of these lost dimensions as well as stimulate the supporting bone and restore or halt the bone loss. Dental implant use has exploded in recent years. They are the most predictable and longest lasting method to replace missing teeth and tissues. Dr. Hammond has received extensive training in dental implants. He attended an intensive mini-residency in dental implant surgery and prosthetics at the Misch International Implant Institute in Detroit, Michigan. This took place over 2 years and included performing various procedures on patients while being observed and instructed by the faculty of the Institute. By receiving training in prosthetic as well as surgical phases, Dr. Hammond is uniquely qualified to aid in planning for the proper placement of dental implants as well as placing them. This training as well as previous surgical experience yields excellent functional and esthetic implant results. Many patients are concerned because they want dental implants, but are not sure they are suitable candidates. In order to determine this, Dr. Hammond will perform a thorough examination and request the proper diagnostic aides including: including x-rays, impression of your mouth and an in-office Cone Beam CT Scan. This allows us to accurately and immediately determine if you’ll benefit from dental implants. Advances in bone grafting procedures allow many more patients to enjoy the benefits of implant dentistry. For implants to be placed, an adequate amount of bone volume (height and width) must exist to accept an implant of sufficient length and width to withstand the forces in a given area. The density of the bone is also important. With greater density of the bone, fewer implants are necessary to withstand biting and chewing forces generated. Bone is usually denser in lower arches than upper, and anterior versus posterior. In general, significant advantages occur when implants are considered prior to tooth removal, or as shortly thereafter as possible. If it is known that a condemned tooth will be replaced by an implant, a socket graft to preserve bone may be placed at the time of the tooth removal. With time, bone is lost and the likelihood increases that augmentation will be necessary before an implant can be placed. After all diagnostic factors are analyzed, a treatment plan will be devised to provide adequate support to withstand forces of the prosthesis. In many instances it is necessary to augment the bone that exists prior to or along with implant placement. Bone augmentation for implant placement is more predictable than grafting procedures around natural teeth. Placing an implant into an area with augmented bone dramatically increases the chances for success. Depending upon the amount and type of tissue desired, it may be necessary to use the patient's tissue, sterilized tissue from other humans or animals or synthetic tissue as the source for grafting. Bone grafting procedures are performed in the dental office under conscious I.V. sedation (see Periodontal Procedures). The predictability of bone grafting procedures has allowed many more patients to enjoy the benefits of implant dentistry. In some instances with newer techniques Immediate Implant Placement is now a reality. For more information see the section on Immediate Implants at the end of this section. In instances when an implant was covered with tissue at placement, it is necessary to uncover the implant. This usually occurs following several months of healing. At this procedure an indexing impression to allow for temporary fabrication may be taken. It is also sometimes necessary to perform minor augmentation of soft and hard tissue at uncovery. 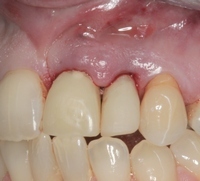 If no additional augmentation is necessary at uncovery, tissues should be mature enough for restorative procedures to be undertaken less than one month after being uncovered. This phase involves fabrication and fitting of the prosthesis that replaces missing teeth and tissues. 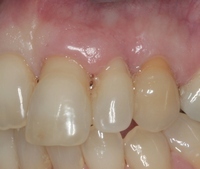 In implant dentistry, the prosthesis is designed prior to placement of the implants. One of the first questions to be answered is whether fixed or removable teeth are desired. Fixed teeth generally require a greater number of implants and a greater investment. Removable teeth are fixed when in the mouth but are removable for cleaning and sleep. They also have the advantage of replacing a portion of the tissues that were lost as a consequence of previous tooth loss. This can improve facial contours. Implants may replace single teeth, multiple teeth or all of the teeth. Fabrication of the final prosthesis is performed by the restorative dentist. In some instances, Dr. Hammond may fabricate temporary restorations to progressively load the bone, prior to fabrication of the definitive prosthesis by the restorative dentist. Sound too good to be true? It’s not. Immediate implants are a real possibility for patients who have lost teeth or choose to have them removed. With immediate implants, healing time is minimal and the implants look and function as naturally as your own teeth. If you’re interested in implant restoration, we’ll perform a Cone Beam CT scan to see if you’re a good candidate for immediate implants. If you are, we can remove a tooth that cannot be saved and place your immediate implant in the very same visit. As with any of our treatment options, if you have questions that were not answered by this brief overview of implants, please contact our office at (256) 882-0255.